Five new judges to the Supreme Court were sworn in on Friday by Chief Justice of India JS Khehar, taking the court’s strength to 28, with three seats still vacant. 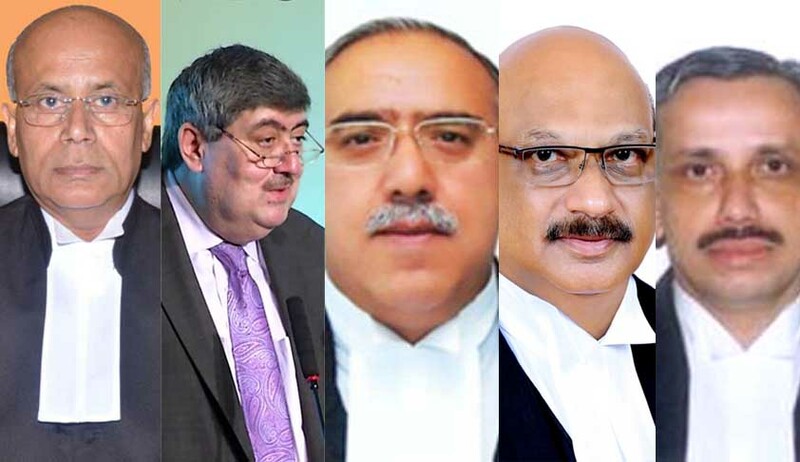 Rajasthan High Court Chief Justice Naveen Sinha, Madras High Court Chief Justice Sanjay Kishan Kaul, Chhattisgarh High Court Chief Justice Dipak Gupta, Kerala High Court Chief Justice Mohan M Shantanagouder and Karnataka High Court judge Justice S Abdul Nazeer were sworn in as judges of the Supreme Court on Friday. Justice Sanjay Kishan Kaul will sit in the Chief Justice’s Court along with Justice NV Ramana and Justice DY Chandrachud; Justice Mohan M Shantanagouder will sit in Court No.2, along with Justice Dipak Misra and Justice R Banumathi; Justice Abdul Nazeer will sit in Court No.3 along with Justice J Chelameswar and Justice Abhay Manohar Sapre; Justice Navin Sinha will sit in Court No.4 along with Justice Ranjan Gogoi and Justice Ashok Bhushan; and Justice Deepak Gupta will sit in Court No.5 along with Justice Madan B Lokur and Justice Prafulla C Pant. Although the date of initial appointment as the high court judge is the same for Justice Gowda and Justice Abdul Nazeer, that is, May 12, 2003; it appears that as Justice Nazeer was initially appointed as the additional judge, and later made a permanent judge on September 24, 2004, Justice Nazeer’s seniority is placed next to that of Justice Gowda. Or it may be that Justice Gowda’s enrolment as an advocate is prior to that of Justice Nazeer. Interestingly, none of the five new judges will get an opportunity to serve as the Chief Justice of India, before their retirement, as all of them would retire, before Justice DY Chandrachud retires on November 10, 2024. Justice Chandrachud will take over as the CJI after Justice Uday Umesh Lalit completes his two-month term on November 8, 2022, and have the longest tenure of two years in recent years. Justice Sanjay Kishan Kaul graduated in Economics (Hons.) from St. Stephen’s College, Delhi University, in 1979 and later obtained LLB from Campus Law Centre, Delhi University, in 1982. He was appointed as the chief justice of Punjab and Haryana High Court in June 2013, before being sworn in as chief justice of the Madras High Court in 2014. His recent ruling upheld freedom and expression and led to the ‘resurrection’ of Tamil writer Perumal Murugan. Justice Mohan M Shantanagoudar enrolled as an advocate on September 5, 1980. He practised for one year at Dharwad in the Chambers of IG Hiregoudar, advocate, before shifting practice to Bengaluru. He joined the chambers of Shivaraj V Patil, advocate (as he then was), who later adorned the Supreme Court. He started independent practice in 1984. He served as vice-chairman of Karnataka State Bar Council from 1991 to 1993 and as chairman of Karnataka State Bar Council during 1995 and 1996. He also served as state public prosecutor of Karnataka from 1999 to 2002. He was appointed as additional judge of the Karnataka High Court on May 12, 2003, and as permanent judge on September 24, 2004. He assumed charge as acting chief justice of Kerala High Court on August 1, 2016, and was sworn in as its chief justice on September 22, 2016. Justice Navin Sinha was born on August 19, 1956. He was enrolled as an advocate on July 26, 1979. He practiced in the Patna High Court for 23 years on civil, constitutional, labour, service, commercial, company (limited), criminal matters and specialised in commercial, civil, service, constitutional laws. He was counsel for several Government of India organisations, apart from private corporate sector. He was appointed as permanent judge of the Patna High Court on February 11, 2004. He was transferred to Chhattisgarh High Court and took oath on July 9, 2014 (FN). Justice Dipak Gupta was born on May 7, 1955, in Nurpur in Kangra district in a family of lawyers. He got law degree from Delhi University in 1978, and started practicing in the High Court of Himachal Pradesh from 1978 and continued till 2004. He was elevated as judge of the High Court of Himachal Pradesh and administered the oath of office on October 4, 2004. He remained acting chief justice of Himachal Pradesh High Court twice, i.e. from June 3, 2007 to July 10, 2007, and thereafter from November 24, .2007 to December 9, 2007. He was the first chief justice of Tripura High Court, later he was transferred and took oath as the chief justice of Chhattisgarh High Court on May 16, 2016. Justice Abdul Nazeer was born on January 5, 1958. He enrolled as an advocate on February 18, 1983. He was appointed as an additional judge of the Karnataka High Court on May 12, 2003, and as a permanent judge on September 24, 2004.